The Carnegie Library opened in 1911 after a few decades of struggle. It’s named “Carnegie” because it was a grant from the Carnegie Foundation that eventually led to the permanent building that made the library come to life. Although the library closed in 1966, Carnegie Park in Livermore now houses a museum and art gallery. It’s also listed on the National Register of Historic Places—and a weekly farmers market takes place in the surrounding Carnegie Park every week. 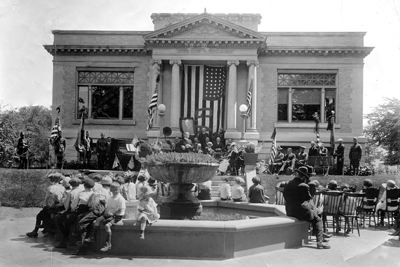 The new building opened in 1911 and continued to serve as the main public library until 1966 when the city built a new central library in the Civic Center on South Livermore Street. 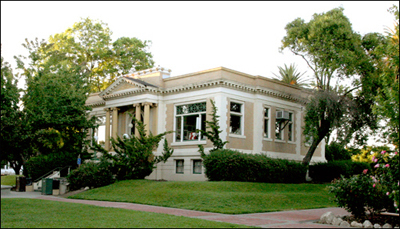 The original structure—revered for its stunning Classical Revival architecture, still stands and now houses the Livermore Heritage Guild’s History Center and Museum. The Carnegie Library sits in the middle of a square block of parkland: 3rd Street on the north, J Street on the east, 4th Street to the south, and K Street to the west. In addition to the locally grown produce folks love to buy from farmers at the weekly market, you can also come with a picnic blanket and relax to the sounds of live music. Carnegie Park in Livermore is a much-loved community effort. For example, The Livermore Herald donated a sundial and several street lamps for the park. The stunning fountain has remained in operation since it was installed in May 1911. But as with everything that survives the test of time, Carnegie Park in Livermore has evolved. The landscaping has changed over time to reflect contemporary needs, such as the addition of a World War II memorial plaque installed in 1946. We know you’ll love Carnegie Park, but it’s true there’s so much more to explore in Livermore. Our free area vacation guide outlines our favorite wineries, restaurants, and sites. Download it today to take the guesswork out of your next Livermore getaway! Stay with us at The Purple Orchid, in the heart of Livermore Valley, and experience tranquility while still being close to all the sights. Added bonus: Our summer concert series is a great reason to plan a stay! And our nearby neighbor Wente Vineyards has its own incredible concert series for you to enjoy. What Are the Best Things to Do in Livermore, CA?